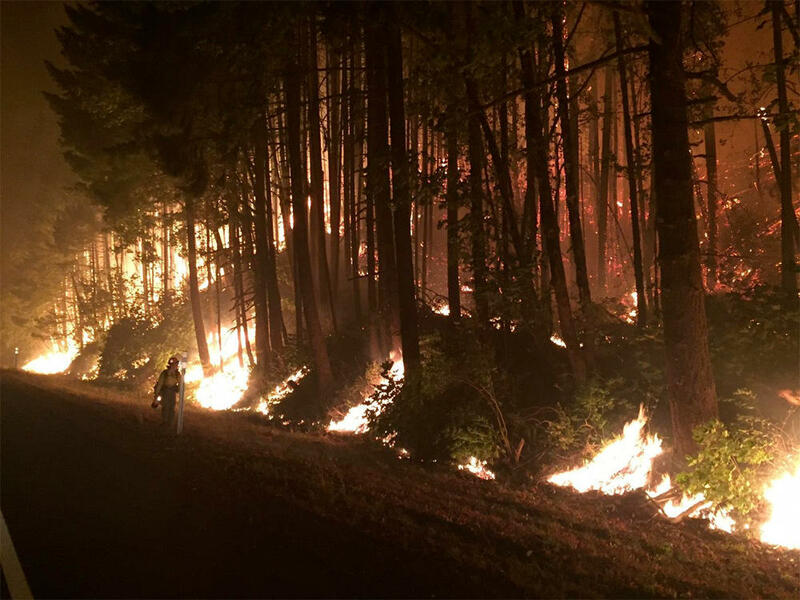 File photo of a night back burn off of I-84 west of Cascade Locks, Oregon, on September 8, 2017. When wildfires are burning around the state, it’s hard for the Oregon Department of Forestry to focus on anything else. During a recent meeting of the Oregon Board of Forestry, State Forester Peter Daugherty explained over and over why the agency has had to put so many things on hold this summer. Daugherty said a lot of routine forest management work—including fire prevention—has been set aside so that the agency can quite literally put out fires. "Pretty much all my time over the past month has been focused on the fire season,” Daugherty said. It’s not a new problem for the Department of Forestry. An audit by the Oregon Secretary of State’s office last year concluded that the agency is “fighting more severe fires with about the same number of employees it had nearly 20 years ago.” Auditors said that’s left the agency’s employees over-worked and over-stressed. And that’s not likely to change anytime soon. The number of acres burned by wildfires in the Northwest could quadruple by the end of this century, according to the latest national climate assessment. “Climate change is here. It's real. We need to work to alleviate it,” state Sen. Michael Dembrow said. The Democrat is one of several lawmakers pushing a bill that would put a cap on carbon emissions and charge companies that exceed the limit. Although the idea has been floated in Salem for years, Dembrow said proceeds from it could be used for forest thinning programs to reduce the likelihood of catastrophic burns. “Yes, our forests can be a way of capturing our carbon but they can also be dangerous sources of carbon if fire gets out of control,” Dembrow said. GOP lawmakers in Salem have long balked at putting a hard limit on greenhouse gas emissions. And they don’t like the idea of linking carbon caps to the issue of wildfires. Republicans blame stricter laws as well as lawsuits from environmental groups for limiting the amount of logging in Northwest forests. They say more logging would reduce the available fuels, and therefore lead to fewer and less catastrophic fires. 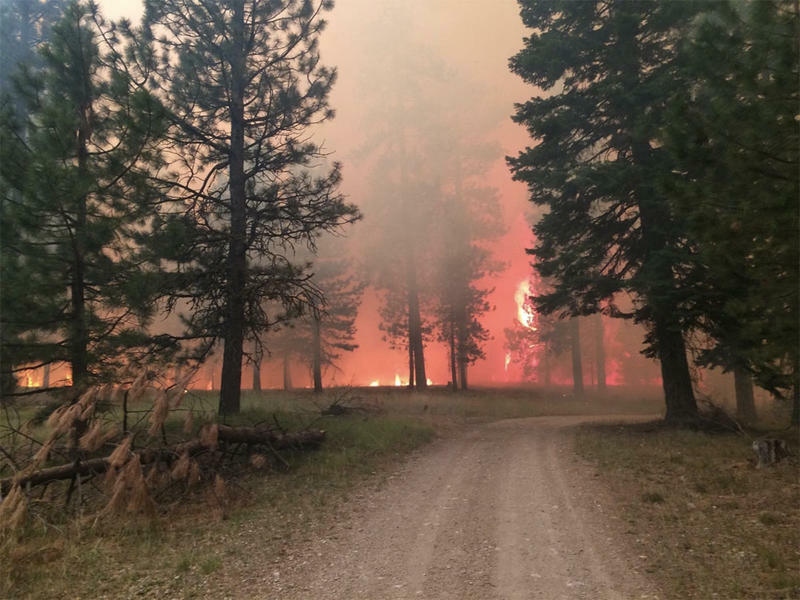 Several GOP lawmakers who represent districts especially hard hit by wildfires are demanding that the legislature hold hearings on forest management. Sen. Herman Baertschiger of Grants Pass appeared on a radio program hosted by Republican Rep. Bill Post. Baertschiger blamed state and federal forest policies for this year’s wildfires. “And because of those bad policies, we’re endangering our communities,” Baertschiger said. And it’s not just Republicans who are sounding the alarm. Democratic Sen. Betsy Johnson said she’s in the early stages of forming a so-called “Wildfire Caucus” for lawmakers who want to make sure the issue gets plenty of attention at the state Capitol on an ongoing basis. Of course, there’s a lot of forest management policy that’s largely outside the reach of state government. That’s because vast areas of Oregon woodlands are owned by the federal government. Gov. Kate Brown said the feds have not given its forest lands the attention they need. And she added that both the state and federal government should devote more money to forest thinning projects that could reduce the spread of wildfires. Daugherty doesn’t want to say whether he thinks more intense wildfire seasons are here to stay. "I would really defer to the scientists that study fire to make those sort of projections as to whether we're in a new normal or not,” he said. “I have not stayed up on that research." But he does think the state may need to adjust its strategies. "I think we do need to step back after this fire season and make an examination of current policy,” Daugherty said. But with fires still raging around the state, that conversation could still be months away from getting started. 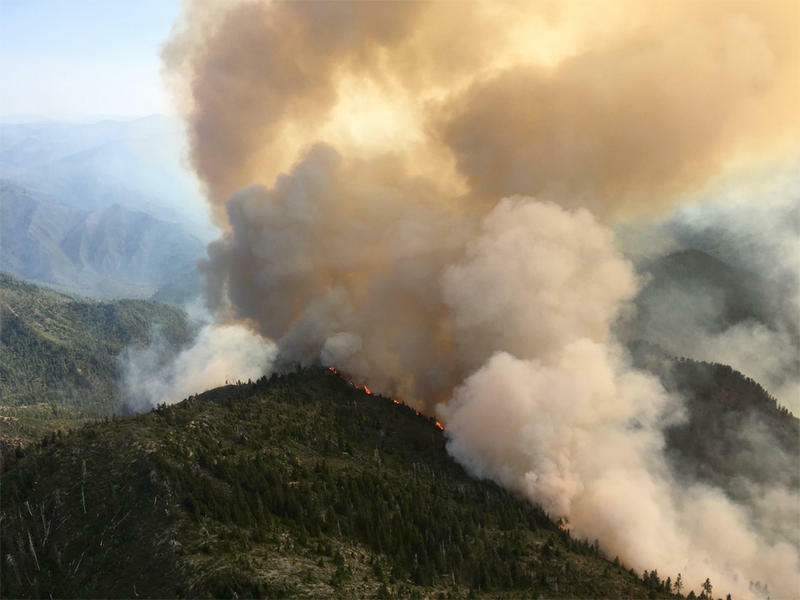 Wildfires have consumed more than 500,000 acres in Oregon so far this year according to the Oregon Department of Forestry. The number includes blazes on both public and privately-owned land.